With the weather being so miserable in the UK for the last few months there has been an upsurge in both hight street and web retailers pushing turbo trainers to cyclists desperate like me to keep some sort of fitness over the winter months. It did not take me long to pick up on this trend, and feeling like time was slipping by, with the Christmas pounds already added I capitulated and asked a friend if I could borrow his turbo trainer for a week. Yes was his answer, once you have fixed the broken resistance lever he replied. Dutifully I took ownership of said contraption, fixed the lever and set out to flat spot my rear tyre in a frenzy of activity that would see that adonis body I have never had return. I hated it. Watching the telly while pretending to exercise was fun. The flat spot on my normal road tyre was not fun, nor was the hassle of getting the bike in and out of the rig, or the slight slant the bike had when it was mounted. This lead me to think. There must be another way! After much deliberation about buying a turbo trainer tyre, the work it takes to swap the tyre over each time and a good look around the internet for a second hand trainer, I started to wonder if there was another way. 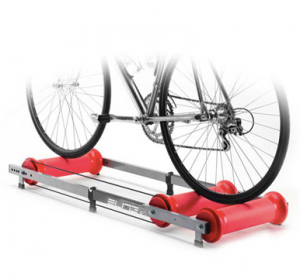 Imagine a simple device that folds away and allows you to just pop your bike on top and train when you want to. Something that is not going to eat normal road tyres and more importantly is going to keep those legs spinning in the dark cold winter months. Strangely enough there are such contraptions, but they come with a drawback or two. More about that later. Conversation in the office on lunchtime turned to this conundrum and a fellow worker piped up with a statement something like this. “You can try my rollers. They are lethal, you will almost certainly die trying to use them, but if you don’t die I would like £40 for them” OK I said chuckling at the fact that these things could not possibly kill me. What could be the problem with them? I asked. I have ridden MTB for a long time, I have tickled some decent speeds downhill on the road too. So fear is not the problem I said to myself. “I’ll have them!” I declared. So here we are. Rollers set up in the conservatory. Bike on top of rollers. Me on top of the bike. Youtube video of how to ride rollers digested and I am off. And by off I don’t mean riding. I mean sitting on the kids wooden fort (turrets and all) The bruise took a following 2 weeks to subside. Had newton been there to see it he clearly would have laughed his head off and then explained the equation. The thing with rollers is that it is a bit like riding on ice. You have no forward momentum and to counter balance this you need good balance. To have good balance you need a strong core. If you have neglected to maintain your core (see adonis above) you are going to struggle. It is not all bad news though. Persevere with rollers and it will train your core, that in turn will make you a better rider. Whether it be looking behind you to see if you have dropped that commuter, or taking your gilet off whist riding, or avoiding ice your core is important as a cyclist. Two weeks later I can ride rollers for 25 mins without dabbing. By that time the corrections my core are having to make to keep me upright are causing those muscles to be tired and I have to stop. I am working on it and I believe I will come out of the winter in better overall shape. Rollers give you a much more natural indoor riding experience and secretly I find them quite fun to ride. I ended up owning the Elite Parabolic Roller which has lips at each end to help you stay on them. Much better for beginners. Whats in the stand: The Yeti is still getting it’s winter overhaul. I have even managed to shorten the disk brake hoses. It is easier than you would imagine.